Hurry! 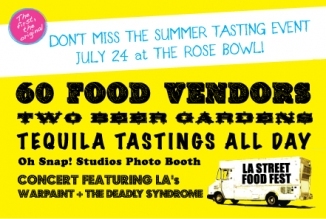 L.A. STREET FOOD FEST almost sold out! Food and fun in the sun with a few thousand of your closest friends. Summertime and the livin’ is easy…especially when you can order all-inclusive, on-line tickets for this Saturday’s L.A. Street Food Fest: the biggest eat-with-your-hands event of the season. The remaining available tix are $65 but you get VIP parking and early access to all the goodness before the rest of your new best friends arrive. That means a full hour’s head start at sixty vendors including gourmet food trucks, old school street carts, and an Ice Cream Social. Most importantly, you’ll be first in line for top mixologist-made cocktails, two beer gardens, and the Upper Deck Tequila and Mezcal Tasting with over a dozen tequilas available for your guzzling sipping pleasure: SO appropriate since Saturday is National Tequila Day. Not that you need a reason to taste tequila…. Your ticket also gets you I-saw-them-when bragging rights at the (relatively intimate) performances of Warpaint and The Deadly Syndrome and you’ll want to bring a shopping bag for crafty gifts at the pop-up Unique L.A. (started by Street Food Fest co-founder Sonja Rasula.) Finally, you can feel good about your good time, which helps the L.A. Street Food Festival give back to the community. A portion of the proceeds will benefit St. Vincent’s Meals on Wheels and will also fund Woolly School Gardens (all-inclusive, wall-sized, outdoor pocket gardens) for at least three LAUSD elementary schools. You can snooze and lose or get crackin’ now and snooze in the Saturday sun, satiated with Sauza, salsa, and ice creamy scoops. Ms. Go Go knows you’ll make the right choice. Next Post Go Go Me! Ms. Go Go is happy to help…with comedy for generationally challenged groups.